Below are listed some signs to identify when your dog is in pain. Reluctance to walk on slippery surfaces. Some dogs may never have liked to walk on wood or vinyl flooring because it was too slippery. However, if this is a more recent issue, then pain needs to be considered as one of the possible reasons behind it. To understand why this reluctance may reveal pain, it’s important to understand how dogs get traction on slippery floors. In general, dogs have very smooth pads on the bottom of their feet. Dogs also cannot perspire out of their pads like we can from our hands and feet, improving our grip when we need it. Because of these two factors, they rely on their nails for traction, but nails won’t help on smooth surfaces. This isn’t a big problem for the healthy dog. Strength and balance on all four legs help them to remain in an upright position, and if one limb does start to slip, it is easy enough to compensate with another limb. But when a dog has one or more bad limbs, problems start to occur. A leg slides out, and she doesn’t have the strength to draw it back toward her body. This doesn’t necessarily spell disaster—if she has three other legs to form a sturdy base, essentially by making a triangular stance. But if there is a second bad leg, then she must suddenly ask her body to balance on only two limbs…easy enough for humans, but not for dogs. Out her legs go from under her, increasing her reluctance to walk on that floor. Dogs are quick learners, and it only takes a few such falls or near falls for them to become fearful of these slippery surfaces. If there is a neurological issue causing weakness or instability, this compounds the fear of walking on the slippery surface even further. Going up or down stairs. Walking up or down a stair puts most of a dog’s weight on either the front or back legs, depending on the direction your dog is moving. Some dogs in pain simply refuse outright to use stairs. Others become reluctant, and will only use them with coaxing or assistance. Many owners describe their dog as standing on the landing and looking up or down the stairs, but not moving until they get their nerve up, or maybe even just barking in frustration. Becoming selective about what to jump up on or down from. Sometimes it might be that a piece of furniture is too high or that the floor is too slippery a base from which to jump. Or you might notice it only when they are trying to jump into a vehicle, where the jump might be low, but they have to jump at an angle to avoid the door or seat. This reluctance to jump may happen gradually, or it might happen overnight if your dog decides “enough is enough” and no longer feels the reward is worth the effort. Attempting to stand up with the front legs first. The vast majority of dogs stand up with their rear legs in motion first—but not dogs in pain. You may have even seen dogs start to stand up on their rear legs, and before they get all the way up, stretch their front end in what looks like a “praying” position. This is normal. When a dog has problems in its hindquarters, however, this becomes too difficult. Instead, they will try to gather themselves together up front first, and you can actually see them pulling with their front legs as they stand. This is not normal and almost always indicates a pain-causing problem, such as hip dysplasia or arthritis (see the figure below). The simple task of lying down may actually become difficult. We have all seen dogs circle and circle as they look for just the right spot and angle to lie down. This normal behavior, however, might become more pronounced in the dog experiencing pain, who eventually progresses to several “false starts” where she begins to lie down, but then aborts the process and starts circling all over again. This might be a result of pain in the joints and muscles accustomed to lying down, or perhaps your dog knows that it has become painful to lie on arthritic joints, and is therefore reluctant to do so. In either case, it is always an indication that something is causing pain. Running and jumping activities are often limited in the dog in pain. Maybe his muscle strength has decreased from months of reduced activity. Or perhaps the impact of landing is just too much for the joints to bear. In either case, the fact that your dog doesn’t run or jump like before should set off an alarm in your head to have this checked out. Placing an abnormal amount of weight on his front legs is generally a sign that a dog is having difficulty bearing weight on his back legs. This can be due to a problem in the knee, hip, or lower back. This forward-leaning stance can be hard to determine in subtle cases, even for the trained eye. Pronounced cases can be seen more easily from the side. Instead of the front legs standing straight up and down, demonstrated in the first photo, they are tucked back under the chest, as you can see in the second photo. The behavioral changes below and the changes in physical abilities described above sometimes overlap, and may not strictly fit in one camp versus the other. For example, a reluctance to run and jump can also be considered a reduced social interaction. So don’t feel confused if you believe that one of these might fit better into the other group. Many behavior changes are impossible for your veterinarian to witness as they are almost always exhibited in the home environment, yet these behavioral issues are probably more important in predicting the presence of pain than the loss of some of the physical abilities described above. If you suspect that your dog is in pain, prepare a careful history of these behavioral points for your veterinarian. Unwillingness to initiate play or other social interactions is sometimes confused with the aging process, and therefore can be hard to recognize, if only for the fact that the changes are gradual, over months, or even years. Again, try to think back a few years, and compare your dog’s behavior then and now. This makes it much easier to determine if some of these changes are real and representing some kind of pathology. Aggression toward other animals where no aggression existed before is one of the hallmarks of pain. I have had clients tell me that their dog is suddenly growling and snapping at other dogs in the same household—dogs that have lived together for years. Pain is a big motivator for your dog to let his “dog friends” understand that their previous interactions are no longer acceptable, and this is often accomplished by a showing of teeth, growling, or even snapping as if intending to bite. Successful pain treatments can sometimes be measured through observation of declining levels of aggression. Aversion to being petted or brushed is another strong indicator of pain. Obviously if your pet never liked these activities, this will not provide a very good yardstick. Consider if you yourself have ever had a painful shoulder, wrist, or other joint: you can often move it around without a lot of pain, as you know exactly what that joint’s tolerance levels are, but have someone grab your arm or shake your hand too hard, and the pain can almost drop you to your knees. Now think about your dog. Petting and grooming can have that same unwanted effect of moving joints in unexpected ways and causing a painful reaction. Disruption in sleep patterns is very common in animals experiencing pain. Painful spots might easily be ignored during waking hours, but the immobility of sleep can put pressure on joints that might not be noticed when awake, as your dog is constantly shifting position to change limb and joint angles, pressure points, and help the joints stay mobile as they redistribute joint fluid through the constant flexion and extension that comes with even the most subtle movement. These dogs often fall asleep for several hours, but then start waking up, moving around the house, and trying to get comfortable again, so they can fall back to sleep. Many of these dogs are exhausted by morning, and as a result, sleep more during the day to make up for what they missed the previous night. You might see the same behavior during daytime naps, where they can’t seem to get comfortable. Stiffness can result from either working or playing too hard, and we all overdo it from time to time, and then pay the price over the next day or two. However, stiffness after rest in the absence of a known predisposing event should be cause for concern. If you’ve ever had plantar fasciitis, you may not have necessarily walked with a limp—at least you didn’t until the time you put your feet up for an hour and then tried to stand up. Similar mechanisms are at play in painful conditions such as osteoarthritis, which may cause the same issues to arise in your dog. 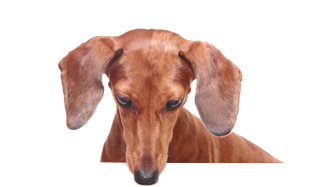 A decrease in appetite may accompany some dogs in pain. Certain breeds, such as retrievers, however, often maintain their appetite and interest in treats even when on death’s door, so the presence of an appetite cannot always be relied upon as the best indicator of pain. However, when any dog quits eating, especially if it is outside the realm of their normal behavioral pattern, pain must be considered as one of many possible causes. House-training issues often arise in geriatric dogs. Although many caregivers come in to my clinic and joke about their dog going through its “second childhood,” the reality of the accidents may be that it is simply too painful to come and find the owner to ask to go out, to negotiate the steps into the back yard, or to face some extremes of outdoor hot and cold. Many dogs just give up, and although they may feel shame for breaking the rules, the alternative is even more painful to contemplate.